Contains millions of natural beneficial fungi to protect roots from disease & then take up feed effectively. Helps plants establsih quicker and better, & makes them more drought tolerant, robust, and efficient. The UK's leading mycorrhizal planting product - as endorsed by the RHS. The completely natural way to look after the secret root system of all plants and trees, each pouch contains hundreds of thousands of naturally occurring beneficial fungi, which help protect roots from disease, and helps take up feed more effectively. Especially beneficial to get bare root plants off to a headstart, it works well for pot grown plants too -and can be used all year long. If you are planting in pots or containers, the natural biological soil bacteria are completely absent, so incoprorating Rootgrow as you plant introduces these natural benefical bacteria, which will colonise the compost, and benefit your plants for many years to come. Similarly if you are planting in poorer soils, or planting a new garden or hedge for the first time, introducing these goodies will help quicker establishment, and better fertiliser uptake in future. Tests have shown they can increase the active root area of plants by 700 times a month after planting. This helps your plants get away quicker and better, makes them, more drought tolerant, use fertiliser more efficiently, and make them more robust. And, because they are a living, evolving community, one application lasts forever. 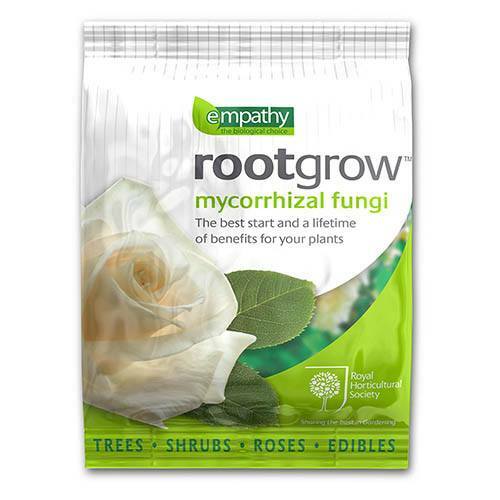 Each 60g pouch is sufficient to plant 3 larger bare root trees, up to 6 roses or shrubs. Supplied as pouch as specified. Store in a cool, dry place. Will last up to 2 years. Totally safe to animals and children even just after application. 60g treats 3 trees or 5 rose bushes or shrubs at planting 360g treats 18 trees and 30 or so roses or shrub bushes at planting.